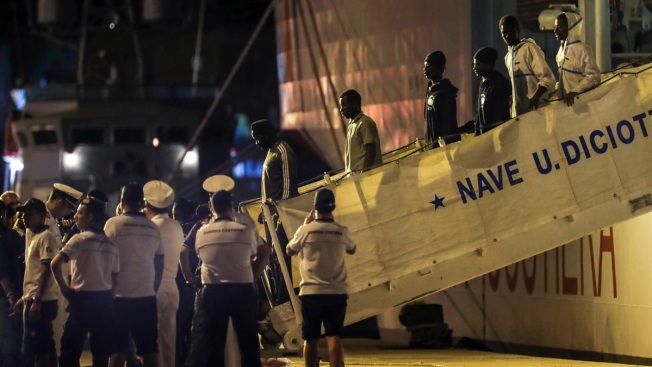 Some migrants during the landing of 67 migrants from Ship Diciotti of the Italian Coast Guard in the port of Trapani in Sicily, in southern Italy. "It's an important result," Conte wrote on Facebook, along with a copy of the letter he wrote to top European Commission officials demanding that other European countries make good on their verbal pledges to help Italy deal with the influx. In just one month in office, Italy under the hard-line, anti-migrant Interior Minister Matteo Salvini has upended years of Italian policy toward migrants by refusing them entry. Italy, in general, feels that the European Union has left it alone to handle the tens of thousands of migrants coming across the sea every year. Salvini is pressing the EU to step up and take in the migrants who land in Italy and is trying to help Libya prevent them from leaving.